For a fun and fabulous fete. When it comes to celebrating a birthday party for kids, it takes a lot of preparation to make sure everything goes smoothly and your guests leave happy. Choosing to throw a birthday party at home means you get to be as creative as you'd like with your activities and games. The more parties you host, the easier it gets to plan a party. Before long, you'll know exactly what steps to take to get everything ready for a fun day. If this is your first time throwing a birthday party for your child, follow the steps below to ensure it will be a fabulous event your child will always remember. Choosing the right theme for your child's birthday party is exciting but difficult because there are so many amazing ideas that abound. 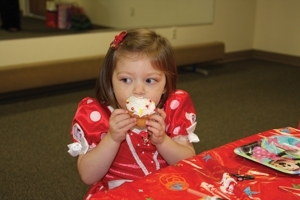 You can decide to have a princess, superhero, movie, or dress-up party. The possibilities are endless! Once you've settled on a theme, you can get started with thinking up related food and snacks. Websites like Spoonful.com offer great recipes and really creative, step-by-step instructions for cupcakes and other treats. Your decorations are also an important aspect of the party and, of course, they should match your theme colors and characters. Think pink for a princess party and black, white, and gold for a Hollywood party. Guests should receive goodie bags with toys and favors that all relate to the party theme, and souvenirs that they make are always appreciated. Activities and games can be classics like Pin the Tail on the Donkey, break the piñata, and Simon Says but with a twist having to do with your theme. For a really cool idea, have the theme be a surprise to your guests, but include a hint on the invitation like bring a mask or dress up as your favorite movie character. You should give your guests plenty of notice by sending out invitations at least three or four weeks before the party. Making themerelated invitations from scratch is a fun activity for you and your kids. Get creative with art supplies like pipe cleaners, pom poms, stickers, and more to decorate your invitations. Another idea is to save on paper and send out an Evite. Several websites allow you to make customized e-mail invitations with tons of template options. It's easy to send these out, and many such services are free of charge. When planning your guest list, consider inviting the same amount of kids as your child's age. If your daughter is 5, let her invite five of her friends to the party. By following this tip, you'll have a more manageable number of guests. The most memorable birthday parties are the ones that feature unique and exciting activities and surprises. Take into account the age of the party guests, and coordinate activities based on the range of ages. For younger children, have a surprise character in costume come to the party. The kids will love getting to meet and play with a beloved figure. Have games with prizes, and make sure every party guest gets an awesome grab bag so that no one leaves empty-handed. You'll likely have lots of parents at the party, too. It's a good idea to have something to keep them happy like finger foods and maybe even some delicious "mocktails." While the kids are left to play, have a designated area where the parents can mingle and talk, watch a movie, or listen to music. Once you have everything planned out, get ready to have a great time with your kids and party guests! It will be rewarding to see the kids running around while enjoying the games and food. Have some other parents around to help with supervision to keep the party under control, and don't forget to take pictures!